Indian captain Virat Kohli has landed in controversy after an incredible attack. 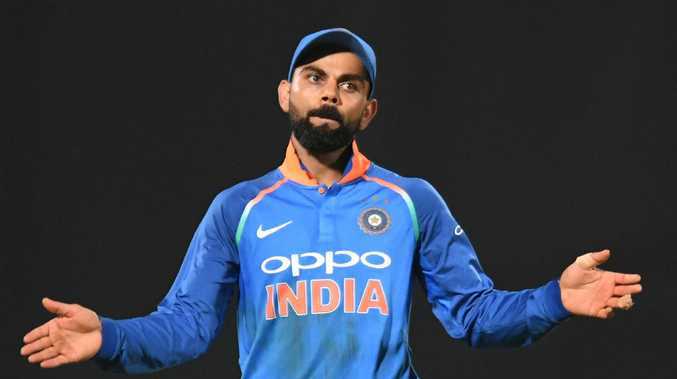 INDIAN captain Virat Kohli has been slammed online after telling a critic to "leave the country". Kohli launched a new mobile app and was answering fan questions when he lashed out after a critical comment. "Over-rated batsman and personally I see nothing special in his batting. I enjoy watching English and Australian batsmen more than these Indians," the fan tweeted. Kohli was savage in his response. "Okay, I don't think you should live in India then … you should go and live somewhere else, no? Why are you living in our country and loving other countries? I don't mind you not liking me but I don't think you should live in our country and like other things. Get your priorities right." The video since went viral and has been shared across Twitter. Fans have been digging up old videos and tweets from the Indian skipper to use against him. In 2016, Kohli tweeted Australian Open champion Angelique Kerber from Germany was "officially my favourite women's tennis player", while in 2008 at the under-19 cricket world cup, Kohli said his favourite cricketer was former South African batsman Herschelle Gibbs. Cricket commentator Harsha Bhogle chimed in with an opinion on Twitter, calling the Kohli statement "a reflection of the bubble that most famous people either slip into or are forced into". "The voices within it are frequently those that they wish to hear. It is a comfortable bubble and that is why famous people must try hard to prevent it from forming," he wrote. "That is also why contrary opinions are frowned upon. Power and fame tend to attract those people who agree with you and reinforce your opinion because they benefit from proximity to fame and power." Indian actor Siddharth, who has over four million followers, had his say about the controversy, leading a storm of social media debate. Virat kohli is a great cricketer no doubt, he lacks basic leadership qualities. The drama comes as India prepare to travel to Australia for three T20 internationals, four Tests and three ODIs starting November 21 and finishing January 18. Last month, Kohli became the fastest batsman to reach 10,000 one-day international runs in a match against West Indies. He achieved the feat in his 205th innings and surpassed Sachin Tendulkar, who did it in 259 innings in 2001.